Anguirus (Japanese: アンギラス, Hepburn: Angirasu) is a fictional character who first appeared in Toho's 1955 kaiju film Godzilla Raids Again. It is the second monster to appear in Toho kaiju films. Anguirus appeared a year after Godzilla. It is the first monster Godzilla fought and it has allied with Godzilla in several other films against more dangerous threats. According to the English subtitles of the 1955 Japanese language film Godzilla Raids Again, Anguirus (spelled "Angilas" in that film) was properly called an Angilosaurus (which in Japanese is pronounced roughly the same as Ankylosaurus), a dinosaur described as "one of the stronger dinosaurs that lived in the prehistoric era." It is described in a textbook by Polish world animal specialist Plateli Hondon as "one of the few creatures that had a thorough hatred for war-like predators," which explains Anguirus' eagerness to fight Godzilla. The dinosaur Angilosaurus lived (according to the film) from 150-70 million years ago, and its remains were affected by the same hydrogen bombs that awoke Godzilla. In the English-dubbed version of Godzilla Raids Again (released as Gigantis the Fire Monster in the US), the name of the dinosaur is pronounced ""ANG-will-o-Saw-rus," and given the sub-moniker "Killer of the Living." They ruled the Earth at one time, according to the film, then disappeared suddenly. From an unnamed textbook in the movie (the same book that in the Japanese-language version was written by Hondon), a scientist reads that these creatures (the angilasaurs) may return from hibernation due to radioactive fallout. Anguirus is said to have "brains in several parts of its body, including the head, abdomen, and the chest." Anguirus was the first enemy that Godzilla ever faced. 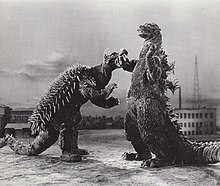 Godzilla and Anguirus battled in Osaka, and after a fierce struggle Godzilla won with a bite to the neck and incinerated Anguirus' body by using its atomic breath. Anguirus clings tenaciously to King Ghidorah in Destroy All Monsters. Anguirus was reintroduced (presumably as a different creature than the one in Godzilla Raids Again) in a brand-new costume in the 1968 film Destroy All Monsters as an ally of Godzilla living with it on Monsterland, a man-made habitat for all of Earth's monsters in the Ogasawara Islands created at the end of the 20th century. This costume is reused throughout the remainder of the Showa series, and Anguirus continued in its capacity as Godzilla's ally. It helped Godzilla repel the space monsters, Gigan and King Ghidorah, in 1972's Godzilla vs. Gigan. It and Godzilla then returned to Monster Island (presumably the same island featured in Son of Godzilla), which was later disturbed by nuclear bomb tests in 1973's Godzilla vs. Megalon. Rodan, perched on a mountain above, toppled down on top of Anguirus, who disappeared when it fell through the ground in a massive split in the earth. Anguirus tunneled its way to a snowy region, where it witnessed Mechagodzilla's first emergence in Godzilla vs. Mechagodzilla. It followed Mechagodzilla underground to Japan where it revealed itself to call upon the real Godzilla and engage Mechagodzilla in battle. However, Mechagodzilla was too powerful for Anguirus and severely injured it, breaking its jaw in a bloody display. Anguirus was forced to retreat underground, although it managed to tip off humanity that its opponent was not the true Godzilla. Showa Anguirus was 60 meters (196 feet) tall and weighed 30,000 metric tons. Anguirus was intended to appear in the unmade film Godzilla X Varan, Baragon, and Anguirus: Giant Monsters All-Out Attack, set to be directed by Shusuke Kaneko and released in 2001. However, Toho requested that Kaneko replace Varan and Anguirus for the more popular King Ghidorah and Mothra, respectively, leading to the release of the film Godzilla, Mothra and King Ghidorah: Giant Monsters All-Out Attack. After a 30-year absence, Anguirus made a return in the 2004 film, Godzilla: Final Wars as a controlled monster of the Xiliens. It appears in Shanghai, and tramples everything in its path, then engaged the flying UN battleship, Karyu. The Xiliens appeared suddenly and teleported Anguirus and the other monsters away. They told the humans that they eliminated the monsters to save Earth, but this was soon discovered to be a ruse, the Xiliens were controlling the monsters. In Shanghai, the Xiliens use their fighter ships to attack the Karyu. While the Karyu was distracted, Anguirus jumped and curled himself into a ball, crashing into the ship at its midpoint. Karyu went spinning in the air before colliding into the Oriental Pearl Tower. Anguirus, King Caesar, and Rodan are pitted against Godzilla at Mt. Fuji. It successfully defeats all three monsters. King Caesar, Anguirus, and Rodan are then left in a heap at the base of the mountain. Godzilla did not kill its fallen foes as a nod to their status as allies of Godzilla during the Showa era. This is in contrast to the remaining majority of the monsters seen in the film, all of whom, aside from Zilla, were enemies of Godzilla during the Showa era, and were slain either by Godzilla, the Gotengo, or the mutants who were part of an anti-monster task force near the beginning of the film. Millennium Anguirus was 90 meters (295 feet) tall, 160 meters (524 feet) long, and weighed 60,000 metric tons. Anguirus only appeared as a skeleton corpse in Godzilla: Planet of the Monsters and was killed along with Rodan by the chemical Bio weapon Operation Hedorah at The Great Wall of China. However in the prequel novel, another Anguirus appeared in South Africa, then another, fourth individual battled Godzilla, along with Baragon and Varan, in Los Angeles, but Godzilla killed them. Anguirus is a quadrupedal giant or irradiated dinosaur that resembles an Ankylosaurus and a bearded dragon, but much larger. Its head resembles that of a Ceratosaurus and Styracosaurus. It has several horns on the top of its head and a single horn above its nose. Its face is long and drawn out, like a crocodile and has rows of long, jagged teeth. Its carapace is studded with long, sharp spikes. Anguirus' tail is covered with spikes (it also had a tail "club" in Godzilla: Final Wars). Its tail makes up most of its body length. Its hind limbs are longer than its forelimbs, and it can stand up on them to its full height, though it generally walks upon all fours. Anguirus has not one but five brains, one in its head which controls all of its organs, and one above each one of its limbs; each brain most likely controls the limb they are above. This gives Anguirus an advantage in battle, for it can react much quicker than most Kaiju monsters. Anguirus first appears in the Showa continuity as brown with yellowish spines, these colors are later changed in the Millennium series to light gray, with orange spikes and horns. In its first appearance in Godzilla Raids Again, it is explained that Anguirus' is capable of moving incredibly fast in spite of its bulk due to its brain extending into its chest and abdominal areas, allowing it to react more quickly. It is able to lunge at its opponents with massive leaps, as seen in Godzilla Vs Mechagodzilla and is also capable of burrowing substantial distances. His long, burrowing journey started in Godzilla Vs Megalon and ended in Godzilla Vs Mechagodzilla, where he resurfaces underneath Mechagodzilla and battles until his jaw is broken. Two of its more impressive attacks involve jumping backward to impale its opponents on its spiked carapace in Godzilla vs. Gigan and its vise-like bite; the most famous example of the latter being when it faced King Ghidorah in Destroy All Monsters where it latched onto one of King Ghidorah's necks, its grip holding firm even as the opponent took flight. Anguirus' best trait is its ability to heal and regenerate energy in a few minutes, as Toho said he recovered almost immediately after Mechagodzilla broke his jaw. Anguirus has incredible durability, surviving being stomped on, being kicked with immense robotic force, being dropped from high altitudes, and surviving Godzilla's famously known atomic breath. In Godzilla: Final Wars, Anguirus was redesigned with the ability to curl itself into a ball and propel itself forward with tremendous speed. The Final Wars version also possessed a spiked tail club like a real Ankylosaurus, though it was not witnessed using it in combat. He also had more spikes, having grown them out of his legs as well. During the existence of the character there have been three official Anguirus suits. The first and second were constructed under the supervision of Eiji Tsuburaya. After the release of Godzilla Raids Again, Toho was looking to release the movie to Western audiences but was having trouble finding a distributor. AB-PT pictures, an American distribution company was producing their own movie, The Volcano Monsters, shortly after the release of Godzilla Raids Again. AB-PT attempted to incorporate the monster footage of Toho's film into their own, but had little success. They struck up a deal between the two companies, a Godzilla and the original Anguirus costume were shipped to Los Angeles to film some additional scenes. Due to financial problems with AB-PT studios, the company collapsed and its assets were absorbed into other production companies. The original Anguirus suit went missing and remains so to this day. The second suit, created for color filming, was built in 1968. The design had no radical changes from the original aside from some modification on the thickness of the spines and arrangement of the teeth. For Godzilla: Final Wars, a third suit was built incorporating modern sculpting methods and animatronics. The final suit is darker in color and somewhat more streamlined and biologically realistic in design. Angurius' roars were created by using the sounds of a saxophone, a harmonica, an oboe, and a tuba. Wikimedia Commons has media related to Anguirus. ^ Lees & Cerasini 1998, p. 118. ^ Ken Hulsey. "Monster Island News". Robojapan.blogspot.com. Retrieved 2015-09-27.